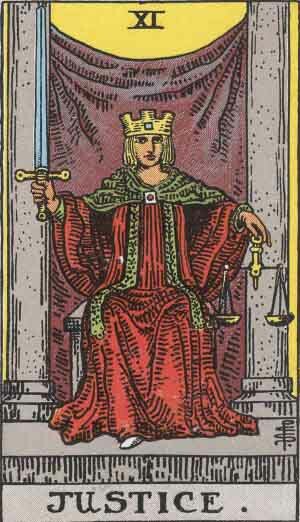 The eleventh card in the Major Arcana, Justice (XI) is a tricky card to interpret, as its meaning is often dependent on your past behavior. The Justice card depicts a woman in a red cloak with a crown on her head. In her right hand she holds an upwards-pointing sword, while in her left she holds scales made of gold. The crown is a symbol of authority, reminding us that justice will always prevail. The sword is double-edged — justice cuts both ways — and is pointed upwards to symbolize victory. The scales represent balance and fairness, their gold coloring serving as a reminder that even the rich must abide by the law. Since the right side of the body is the logical one and the left side is the intuitive one, holding one object in each hand conveys that both logic and intuition are necessary to dispense justice. Decent, law-abiding individuals are represented by Justice. They make decisions carefully, weighing all the pros and cons. These people are good with words and often place a high value on education. As a person, Justice is also practical and cautious, but remains a romantic at heart. In the upright position, Justice is a sign of truth and balance. Decisions will be made fairly and honestly — as such, you should respect their outcomes. Important choices should be thought out with great care and integrity. In an actual court of law, any legal disputes you are involved in will be resolved in your favor. The meaning of Justice in a relationship reading depends on how you have treated people in the past. If you have treated others with kindness and respect, the universe will send you kindness and respect in return. Inversely, you will feel the wrath of justice if you have treated others with coldness or contempt. Even when the card is upright, you can expect to receive a comeuppance if you are guilty of having lied to or cheated a partner in the past. The Justice card can also be a sign of a balance being restored to your love life. If you are single but have been yearning for someone, you will soon meet your other half. If your partner has shown opposition to getting married or having children, the two of you will soon be on the same page. Find a better work-life balance — you’ve been spending too much time at the office or focusing on your career, and not enough time with your loved ones. Justice is a reminder that work isn’t the most important thing in life. If you are owed money, Justice is a good sign that you will be repaid soon. If you have been stingy with your finances lately, find some room to lend money to a friend in need, or donate to a charity you believe in. This is also a good time to take care of financial affairs that involve the law such as writing a will, filing for child support, or going to small claims court. The Justice card is all about balance and karma. If you’ve been eating right and working out, you will continue to see the results of your hard work. If you’ve been slacking off in these areas, you should reevaluate your lifestyle choices and make health a priority — your relationships and overall quality of life will benefit significantly from it. 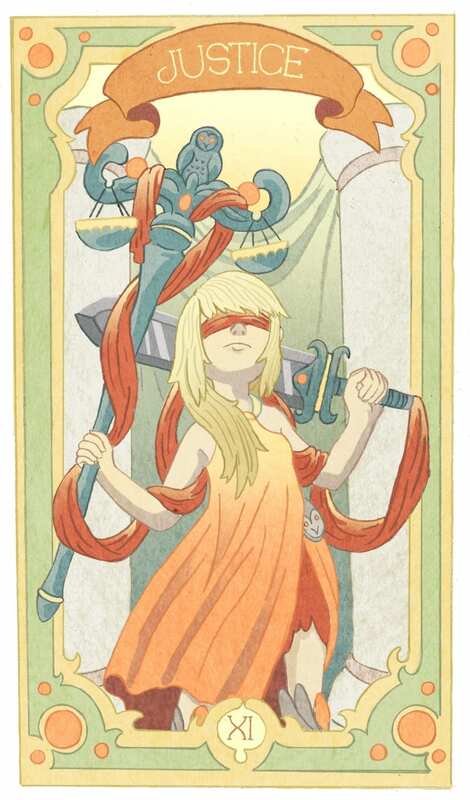 A reversed Justice card indicates dishonesty and an inability to take responsibility for one’s actions. It can also be a sign of lying or acting unethically. Do not try to avoid the consequences of your past actions — it would be much wiser to address the situation head on before it spirals out of control. In a relationship reading, reversed Justice means that you are being dishonest with your partner about your true feelings. If you have a secret desire or you no longer feel as strongly about them as you once did, it is imperative that you tell them now. This card can also be a sign of infidelity or unresolved trauma from a prior affair. You are being treated unfairly at work. It is possible that your boss or coworkers are taking credit for your accomplishments, or that you are being overworked and underpaid. If you feel as if you are being sabotaged or taken advantage of, Justice is a reminder to approach the situation calmly and with logic. Set up a meeting with your supervisor and ask for fairer treatment. If this does not go well, ask for a transfer or start looking for a different job. Whether through stealing, lying about your spending, or borrowing too much, you have been acting unethically with your money. This dishonest behavior is eating you up inside and causing fractures in your relationships. Tell the truth and face the consequences of your actions. Failure to do so now will only make your eventual reckoning even worse. You have been over-engaging in drugs, alcohol, or other compulsive behaviors. Cut back until you have a better handle on yourself or you will soon run into serious health problems. In the past position, Justice indicates that you are now feeling the consequences of a major decision you once made. These consequences made be good or bad, but your decision was made under a haze of confusion. Try to approach future choices with a clearer head. When Justice is in the present position, it is a sign that you are at an impasse. You will not be able to make this decision alone — you must ask for advice, even if that makes you feel vulnerable. These choices will set the foundations for many years to come. Drawn in the future position, Justice means that any past wrongs you have suffered will be righted. Those who have hurt you will face justice, and you will emerge victorious with the respect and admiration of your community. In pairings, Justice tones down the meaning of the other card and infuses responsibility and morality into the reading. Someone you trust is misleading you into making a poor decision. The Magician may represent an individual who is trying to sell you something or convince you to act outside of your moral boundaries. This person may also try and hold you back from improving yourself. This combination compels you to speak up and tell the truth, especially if it means standing up to an authority figure. You will have a long and happy marriage that is based on trust, honesty, and communication. This union will produce children and strong family ties. This pairing means that you will experience success in a big city. The World card suggests that your career will flourish or that you will live a transformative romantic adventure. A symbol of balance, the Justice card is neutral. Live virtuously and you will eventually achieve the results you desire.